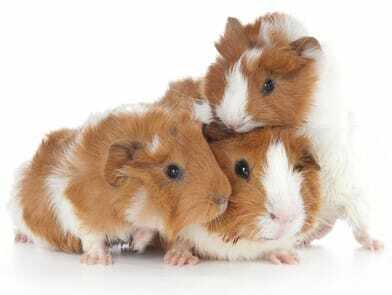 According to The American Cavy Breeders Association, there are 13 recognized guinea pig breeds with certain acceptable varieties in each of the breeds. They all have distinctive appearances so it’s rather easy for the cavy lovers to distinguish between the breeds. Apart from these, a number of less common varieties are equally popular. 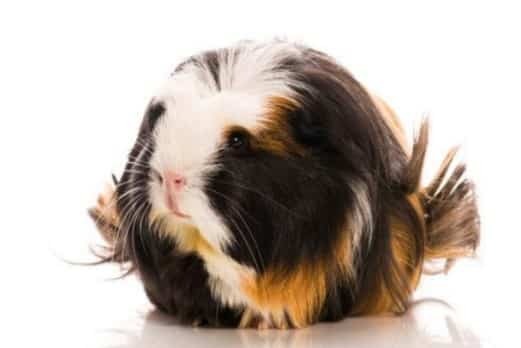 Although they are different as regards their color, size, shape and overall appearance, all guinea pigs have colorful personalities and are lovable and affectionate. For showing purposes, guinea pigs are divided into ‘Self’ or ‘Non-Self’. The term ‘Self’ refers to smooth-coated cavies of a single color. ‘Non-Self’ includes all other varieties in coat varieties including one-color longhaired piggies. Native to South America and domesticated about 3.000 ago, guinea pigs (also called cavies) have been favorite pets in many homes for a long time now. 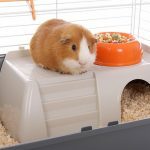 They make wonderful companions and bring tons of joy and fun, as long as you provide them with the best guinea cage you can afford, healthy piggy food, and fresh water from a quality guinea pig water bottle. The Abyssinian guinea pig is one of the oldest species of cavies. They have somewhat long hair with swirls, which make them ideal contestants in guinea pigs shows. They have eight to ten rosettes and erect ridge patterns of their fur on the body as well as on the head. They also have a mustache of raised fur around their nose. Abyssinians come in a variety of colors and color combinations. Because of the long hair and curls, it’s a bit more difficult to look after Abyssinians. You will need to devote a little more time for grooming than for breeds with shorter coat hair such as the American. As for personality, the rumor is the Abyssinians have a playful, active and mischievous personality which guarantees loads of fun. The American guinea pig is the most common breed of all. 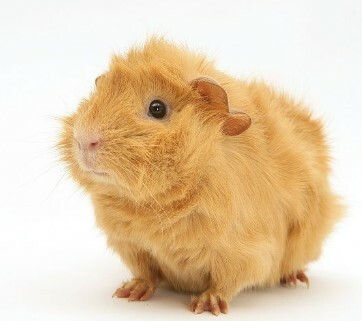 When people think of guinea pigs, they mostly have a picture of an American cavy in their head. This breed is kind-natured and gets along well with children and with other piggies. The reason for their popularity is probably because they’re really easy to take care of. 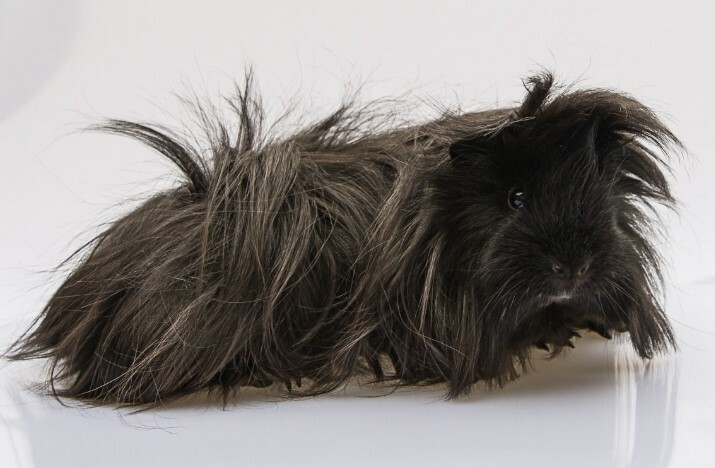 Very few guinea pigs breeds have short hair like the American so grooming them isn’t as time-consuming as with the long-haired breeds. They are recommended as kids’ pets as even little kids can maintain the neat and healthy coats of the American cavies. They may not look as exotic as some of the long-haired breeds but they are certainly cute and lovable. These piggies are easy to identify because they look like they have a rosette-shaped white crown or, in other words, a white crest above their head. Because of this distinctive feature, they got the name “Crested”. The White Crested piggies come in a variety of colors, but exclude those colors where the white color is present anywhere in the coat apart from the top of their foreheads. Their short, smooth hair makes them easy to groom so the kids can take care of them as well. Although the White Crested cavies are much harder to find than the American piggies, they are pretty much the same in terms of character and ease of maintenance. 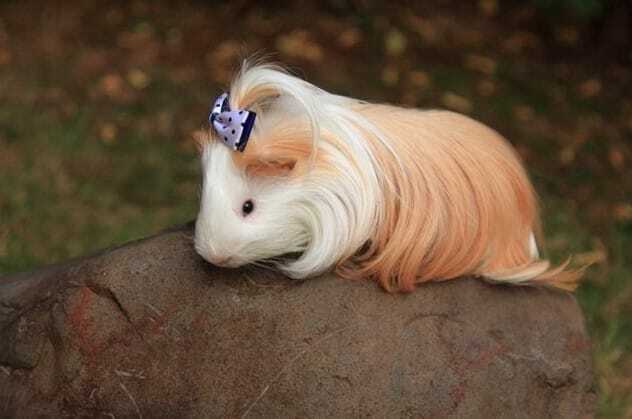 A Coronet guinea pig is a long-haired variety of the White Crested guinea pig but it’s recognized as a separate breed nevertheless. It has one rosette called a coronet in the center of its forehead and a crest. The long hair grows backward over their body but, otherwise, they look very much like Sheltie guinea pigs but with the crest. If not looked after, their hair can become all knotted or matted so this breed needs plenty of grooming and maintaining. A Coronet’s hair needs a trim once or twice a month. When grooming a Coronet, we suggest that you use a plastic comb of short brush and follow the direction of the hair when brushing. You need to pay special to hair at the bottom and around the backside. This is because excrement can build up very easily and the hair around that area needs careful and thorough trimming. In addition, you need to check under the hair which hangs over its eyes to make sure that your piggy’s eyes are still clear and bright which is a sign of good health. If you have little free time and experience in looking after cavies, Coronets may not be the right breed for you not because of the amount of care they need. 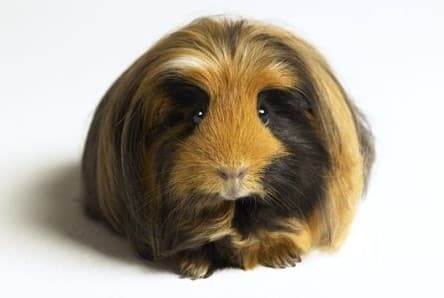 Of all the different breeds, the Peruvian guinea pig has the longest hair. The longest hair ever recorded in any guinea pig reached 20 inches long in a Peruvian piggy. Unlike the Abyssinian, the Peruvian has straight hair. Since the Peruvians need quite some time for grooming, some owners opt to cut their hair short to avoid having to brush it on daily basis. This sounds silly to me because what’s the point of having an exotic Peruvian cavy if you’re going to cut its beautiful long coat? If you decide to have one, combing is essential. 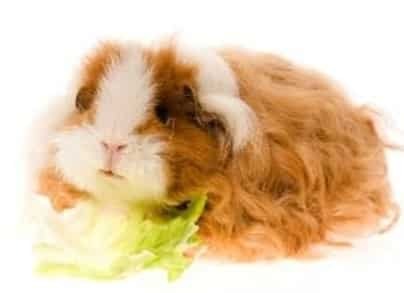 If you don’t comb them regularly, their hair will get tangled and cause discomfort to your cavy. The Peruvian tends to be more curious pets than all the other breeds. They are just as loving and will often come to greet you or play with you anytime they get a chance. If you intend to buy one for your kids, bear in mind that you will be in charge of grooming. The Silkie guinea pig is also called Sheltie. It is similar to the Peruvian in the sense that it has long smooth hair. However, where they differ is in that the hair around a Silkie’s head sweeps back looking as if it had been purposely slicked back. The long hair requires frequent and careful grooming, which isn’t recommended for kids to do. However, if you’re a parent who’s ready to take on the grooming duties, your kids will certainly enjoy having a Silkie as a pet. Their hair is shinier and softer than the Peruvian, so they are even more interesting for little children to play with and show off to their friends. Having a short and dense coat, the Teddy breed of cavies is often described as wiry. Their coat may not be as soft as in other breeds, but they are relatively easy to groom. The reason why they’re called the Teddy is that of their obvious resemblance to a teddy bear soft toy. 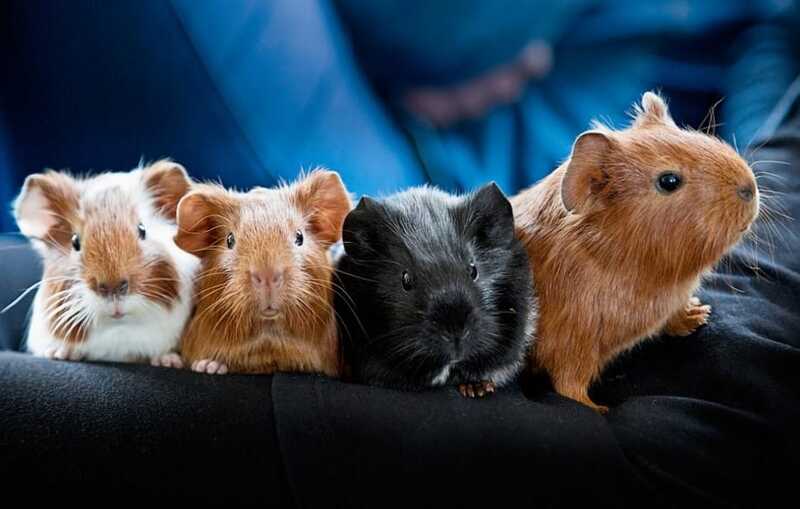 They are also known for their upturned nose, which is exclusive to this breed of guinea pigs. 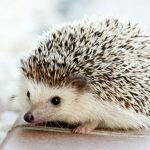 Because of the specific nature of their coat, occasional brushing is needed to remove the unwanted bits of food, hay or dirt stuck in their fur. The Texel guinea pig is a remarkable species favorite among the keenest cavy enthusiasts. They have curly soft hair not just on their backs, but throughout the whole body, including the belly. 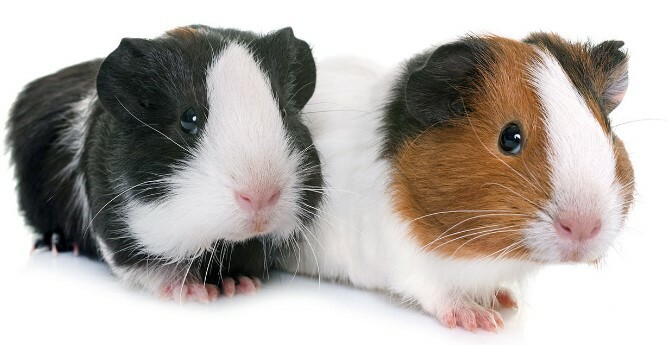 The unique coat has made them one of the finest and most successful breeds for guinea pigs shows. Because their coat is extremely prone to tangling, this breed is the most difficult to groom and requires the most care. We recommend the Texel breed to those of you who want to show off their guinea pigs and don’t mind the level of dedication and the time required to look after such an exotic piggy. Aim for the first prize at some of many guinea pigs beauty contests and good luck! Abyssinian Satin, American Satin, Peruvian Satin, Silkie Satin and Teddy Satin basically have very similar features to the original breeds but their hair has a shiny, satiny appearance. In general, these have softer coats with a glossy satin sheen, and they feel like satin to the touch. Take a look at this lovely Peruvian Satin! 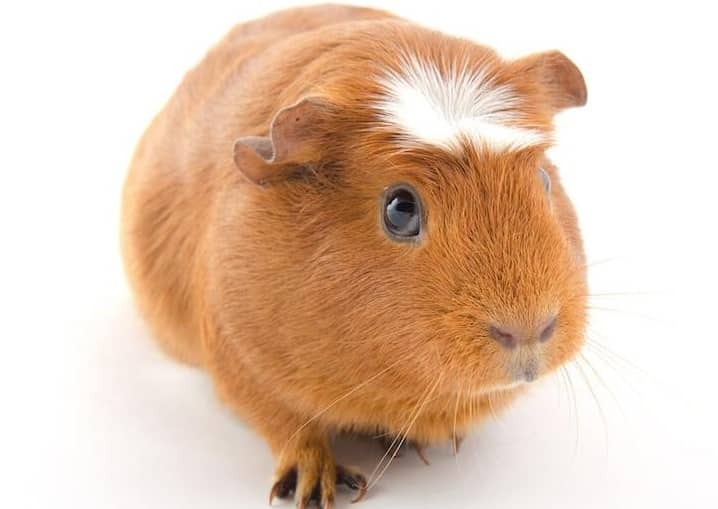 Make sure to leave a coment with your favorite guinea piggy breed in our Ultimate Pet Hub comment section below.